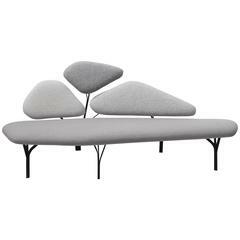 Lawless sofa Each is a unique hand-sculpted creation by Evan Fay Dimensions: W 1676, D 863, H 1016 mm W 66”, D 34”, H 40” inches Materials: Steel, brass, foam, Knoll stretch appeal upholstery fabric. Lawless chair is a celebration of irregularity within a system, pursuing a more artful form that responds to the chaotic landscape within our structured society. The punk aesthetic within the chair contextualizes a poetic moment to reflect and voice through design, an attitude towards our hectically evolving environments and contemporary dilemmas. Taking ownership of truthful possessions, finding comfort in dystopia, and beauty in chaos may be a confronting reality and opportunity to embrace new expressions in design. Made to order creations can be done: dimensions and fabrics can be modified. Extending the lines of the rope chair to a two-seat sofa the play of fabric, metal finish and lasso of rope, which threads in and out of the base, generates an edgy glamour. Long lounge with strong edges, but soft in all the right places. Basically a great romantic, but the contrasting upholstery adds melodrama to the act. 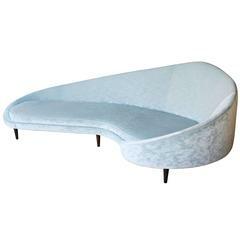 An iconic graceful and elegant design by Italian designer, Federico Munari, in vintage wool velvet upholstery. Danish modular sofa in leather and canvas designed by Jens Eilersen in the mid-1970s. 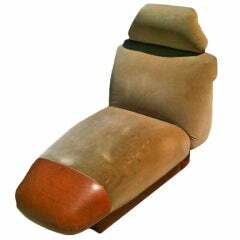 Great comfort, leather with nice patina.